Philippines, the "Pearl of the East", is regarded as a "Mystical Nation" with many supernatural occurences. These include ghosts hauntings, nature spirits manifestations, sacred places, religious miracles and psychic people. There is a belief that this country was once part of the highly psychical Lemuria in the early years of human existence on this planet. Others believe that our nation is the next Jerusalem because of spiritual evolution of Filipinos. 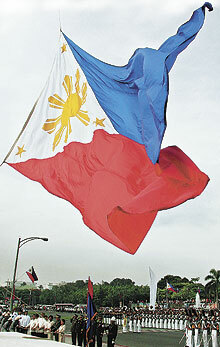 The Giant Philippine Flag was raised in the traditional flag raising ceremony at Rizal (Luneta) Park for the celebration of 108th Year Anniversary of the Philippine Independence (June 12, 2006). In this photo taken by the Manila Times photographer Aaron Favila, the flag seems to express a message. Spectators saw in this photo the UP oblation, and the Winged Victory sculpture. Personally, I would see it as a good and bad omen meaning there is hope the Philippines would achieve its success (winged victory) but the country would always face some difficulties (hog-tied oblation). The future of the Philippines lies on how the people of the government and the citizens handle the present political and economic issues. 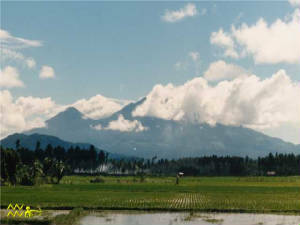 Banahaw is located 100 kilometers southeast of Manila. It is the highest peak among a series of mountains and is surrounded by the towns of San Pablo, Majayjay, Liliw, Nagcarlan, Tiaong, Candelaria, Sariaya, Lucena, Tayabas and Lucban. Being an active volcano, its last recorded eruption was on 1721. That eruption caused a lake to form on the volcano’s crater which may have caused the crater to burst open during a possible eruption of 1743, though geographer Fr. Huerta mentioned in his Estado Geographica that it happened sometime 1730. The crater today is called ilalim. It also resulted the transfer of the town of Sariaya to its fourth and present site. In the 19th century Banahaw was called Monte de Majayjay or Monte San Cristobal which was then considered the "gateway" in ascending the mountain. It was also called "Vulcan de Agua" because of the numerous springs that flows from the base. The present name Banahaw might have been derived from the word Ban-aw which means a vantage point to a lofty position. Mount Mayon was derived from the legendary Bicolana girl Daragang Magayon, whose name literally means woman beauteous. 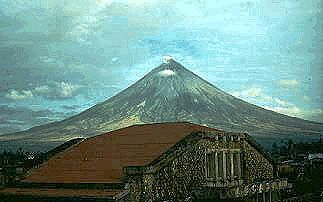 That was why in the whole region, she was the kabinibinihan (modest) of them all.Mount Mayon has the classic conical shape of a stratovolcano. It is the most active volcano in the Philippines. Since 1616, Mayon has erupted 47 times. The beautifully symmetrical Mayon volcano, which rises to 2,460 meters above the Albay Gulf, is the Philippines' most active volcano. The structurally simple volcano has steep upper slopes that average 35-40 degrees and is capped by a small summit crater. The historical eruptions of this basaltic-andesitic volcano date back to 1616 and range from Strombolian to basaltic Plinian. Eruptions occur predominately from the central conduit and have also produced lava flows that travel far down the flanks. Pyroclastic flows and mudflows have commonly swept down many of the approximately 40 ravines that radiate from the summit and have often devastated populated lowland areas. Why Early Pinoys Call God, Bathala? Sacred Mountains/Volcanoes in the Phils.